Clamps to any desk, table or tray from 1/2" to 3"
The height range for Table Clamps really depends on the length of your Mount'n Mover post. 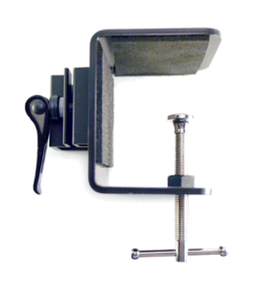 Use the height set screw built into the Mount’n Mover post for repeatable mounting height! You can even mount below your table clamp. This is especially helpful for children or people in manual wheelchairs or regular desk chairs. 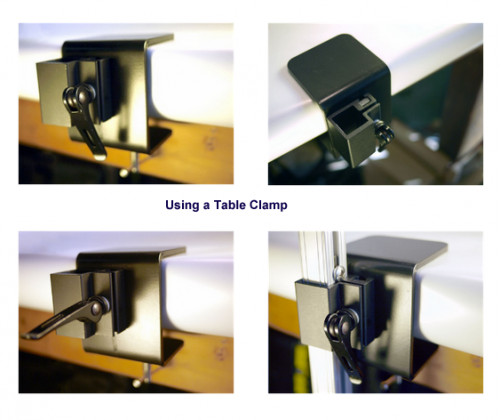 CLAMPS TO ANY DESK FROM AS THIN AS 1/2" TO 3"
The table clamp uses a simple screw clamp to attach to tables and desks. Because we use a simple screw-clamp, the Table Clamp can easily get over and around tables with lips or even tables with uneven underside edges. We do not recommend attaching to tables thinner than 1/2" as this typically is too flimsy to support the weight and moment of a Mount'n Mover system. You may find you need to use a shim or piece of wood to provide a better clamping surface or to reinforce thinner tables. You can accomplish this by inserting a plate or piece of ½” thick wood beneath the table.